Be on the lookout for elm leaves that turn yellow during the summer. Dutch elm disease (DED) is a deadly disease caused by a fungus (Ophiostoma ulmi) that can affect any elm tree. Since its introduction from Europe about 1930, it has destroyed millions of American elm trees across North America. Edmonton has one of the largest concentrations of uninfected American elms in the world. An isolated case of DED was discovered in Wainwright, Alberta in 1998. Although Alberta is still disease free, the beetles, which carry the disease, have been found in Edmonton and St. Albert (since 1995), Calgary (since 1994), and Vauxhall (since 1996). Since then, they’ve been found across the province, from Medicine Hat to Grande Prairie. In other areas, DED arrived three to seven years after the first detection of elm bark beetles. Therefore, the City of Edmonton is investing in a preventative strategy to protect one of the world's last stands of healthy elms. Monitor the condition of the elm trees in your neighbourhood. Report any damaged public elm trees that require pruning to the City (call 311 or email citytrees@edmonton.ca). 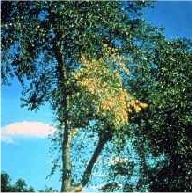 Watch for these symptoms of Dutch elm disease: drooping and yellowing leaves in summer, branches with smaller leaves than rest of the tree, branches with no leaves, and brown wilted leaves that remain on the tree. If you suspect DED on any public or private elm tree, please call 311 or email treebugs@edmonton.ca. Apart from being ideal breeding material for the beetles, elm firewood is especially problematic as it is easily and often transported from place to place. It is in this way that the beetles and DED are most readily transported long distances, and it is likely that the introduction of the beetles into our city occurred in this manner. Because DED can be carried on elm firewood, provincial regulations prohibit storage, transport and sale of elm firewood. So if you go camping, please do not transport firewood. Prevention of Dutch elm disease starts by keeping elm trees healthy. Prune all dead wood that provides beetle habitat. Pruning of healthy elms, however, should only be done during the winter season when the beetles which are attracted to fresh tree wounds are not active (October 1 to March 31). According to Edmonton's Community Standards Bylaw it is illegal to prune elms between April 1 to September 30. Elms that suffer major injury such as a lightning strike or storm damage during the summer may be pruned, but branches must be chipped, burned or buried promptly. A City inspector may also approve limited clearance pruning to mitigate electrical hazards or to avoid construction damage. Written permission must be obtained prior to any elm pruning performed during the elm pruning ban (April 1 to Sept 30) by contacting the City at 311 or treebugs@edmonton.ca. Elm branches and logs must be disposed of properly. Bundle small branches, 25 mm (one inch) or less in diameter, and place at the curbside with regular household waste. Large loads of elm wood, more than a half-ton truck, and commercial loads must be taken to the Edmonton Waste Management Centre (fees apply). For citizens who need help with pruning, the City recommends using professional arborists certified by the International Society of Arboriculture (ISA). Elm trees may be removed any time of year, however all wood must be properly disposed of (cannot be kept as firewood) and elm stumps should be de-barked or ground to a depth of 10 cm (four inches) below soil level. Remember, Edmonton bylaw prohibits the storage of any elm wood that you may have pruned. Please help us keep Edmonton's elm trees DED-free. Edmonton has one of the largest concentrations of uninfected American elms left in the world.